Apart from being a Blogaholic and a Shopaholic, I am foodie too(well who isn't! *winks*) From South Indian Bisi Bele Bath to North Indian Aloo Parathas and Chhole Batures, I love eating almost everything which is halaal! choose from and they also offer amazing coupons and discounts on online payment restaurants. I have personally avoided ordering food online as I have had experiences where the food comes in when I am no more hungry but that's not the case with JustEat! I am happy to say that I ordered food from JUST EAT on December 6 at 7:00 PM and got a confirmation mail the same moment stating that my order was being processed and I would receive it within forty five minutes. Not before it was 10 minutes to eight there was a knock on the door and voila! There my order was, hot and burning to get inside my hungry stomach! While ordering through JustEat, I would recommend you to choose a good restaurant to order your food from. When I specified my area at JustEat, I had a very massive list of restaurants to choose from. I chose a vegetarian restaurant called New Chakhle India Dhaba(weird name na?!) The food was real good but very very very spicy! Hence I would recommend you to choose a restaurant which suits your preference. The best thing about the website is that the customer not only has the option to choose a restaurant of his choice but he can also specify his preferences in the comment box while checking out. They have this amazing feature where you can specify your preference for eg. 'allergic to peanuts' 'diabetic' and so on and they will keep these things in mind while processing your order. This is something I truly loved! That's a quick pic I took of my order. All the food items were neatly packed inside hygienic containers and aluminium foils. All of it was burning hot and so very delicious! 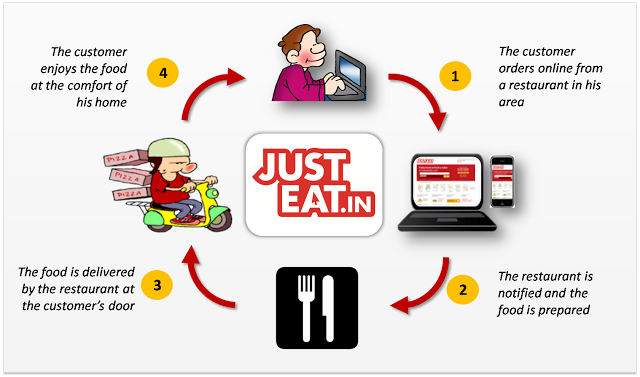 So friends, I really had a wonderful experience at JustEat.in, and I totally recommend this awesome website to all you busy buds! Drop in your answer along with your city name in the comment section below. The most Creative and Funny answer wins 500rs worth gift voucher from JustEat.in! The contest ends on the 16th of December so hurry up! PS: I live in Ahmedabad. Okay! Now this is officially a great review of the website :D I love takeouts too! 1. When there is an online Blogging Contest submission last-date, I'd rather work on my entry than spend time in Kitchen! 2. When my home is getting painted. I can't cook na! Well , actually I don't need any excuse to order food online :-P..I just love to eat..:-D.. It's not an excuse, but a safety precaution from me.. Actually, I'm saving lakhs that will be spent on a new house, after I turn my current home to ashes while trying my hands in th kitchenHouses aren't cheap in Bathinda either! I love my bed and i wanna shop from there! Good to know that such a food website exists, even though we prefer to cook at home. Definitely this would help in case of emergencies. Thanks for the post. great help for the modern day women who hate cooking :D nice !! A very simple and straightforward answer from me - I hate cooking !!!!!! !